There’s a great blog post on YARN (Young Adult Review Network) about the danger of the blockbuster mentality in the publishing world, and about the value of the fast-disappearing “midlist” – books that neither sold millions of copies nor flopped, by authors who had talent and the potential and promise to keep writing good quality books. What about you? Books that maybe haven’t hit the bestseller list or been heaped with literary awards or prizes, books that haven’t received much publicity buzz from publishers or reviewers, but good books nevertheless. Share your favorites in the comments! Every week I get an e-mail from LinkedIn with the top five articles of the week. Usually these are along the lines of “what makes a remarkable boss,” “how to be a great employee,” “what interview mistake are you making?” etc. But this week there was a link to an article called “Job seekers getting asked for Facebook passwords,” and yes, this is exactly what it sounds like. What legal recourse do you have to say no? Is this like the Fourth Amendment where they have to establish probable cause? On the other hand, if you refuse, that job opportunity might be lost to you, and in this economy, who can afford that? Well, giving anyone else your login information is a violation of the Facebook terms of service, but right now that’s the only obstacle in these invasive employers’ way. The ACLU has protested the practice, and some states – Maryland and Illinois – are working on legislation to forbid public agencies from asking for access to social networks, but private companies could continue it. This touches on a larger issue. I was horrified to read about this practice, and even in an interview situation where I really wanted or needed the job, I think I would say no if asked for my password to Facebook (let alone e-mail!). It’s not that I have anything to hide, but rather the principle of personal privacy that’s at stake. The whole idea of privacy may be eroding; it seems to be less important to “Millennials” (just Google “Millennials + privacy” – some articles about how savvy they are at protecting it, others about how their views on it are simply different from traditional views of personal privacy). From personal observation, it seems that teenagers and those in their early 20s are less protective of their personal information – and with so much of it available online, it might seem like a hopeless effort to keep any information private. However, for a potential employer to ask you for personal information that you have deemed private seems beyond the pale. (It may also allow them to find answers to questions they are not legally allowed to ask in interviews, such as your age, marital status, or religion.) They already have your resume, your cover letter, your application, as well as whatever they have gleaned from what is publicly available online; they can contact your references and ask you questions in an interview; they can even give you a drug test (with your consent). Is it really necessary to hand over your passwords as well? I think not. Do not pass Go, do not collect two hundred dollars: Apple and the publishers vs. Amazon? Do you buy e-books? Did you feel surprised, taken aback, betrayed, indignant, outraged when the average e-book price suddenly jumped from $9.99 to $12-15? Now: have you thought about why those prices changed? First, it’s important to understand that $9.99 is not the actual cost of an e-book: Amazon set that price point, and they were taking a loss on every e-book sale, in the hopes of luring more and more customers to buy their Kindle e-reader. Amazon was able to set e-book prices because they bought the books from publishers on the “wholesale” model: Amazon paid the publishers about half the cover price of the book, then set its own price for its customers. A quick note about the real cost of a book: just because it’s a digital version – an e-book – rather than a book printed on paper doesn’t mean it was free to produce. Authors, editors, publicists and marketing people still had to be paid, offices still had to have lights on and computers running. The cost of paper and printing is somewhere in the neighborhood of $3 for a hardcover, less for a paperback. When you think about it that way, maybe paying an extra few dollars for your e-books is worth it. After having written about the Digital Public Library of America (DPLA) recently, it’s only fair that I should write about the Internet Archive as well. (Brewster Kahle, founder of Digital Librarian of the Internet Archive, is actually on the DPLA Steering Committee, so the two organizations are linked.) The Internet Archive is, quite simply, an Internet library. It is a nonprofit and was founded in 1996, so it’s been around for some time now. One of its cool features is the “Wayback Machine,” which allows you to plug in a URL and pick a date to see what a given website looked like, say, ten years ago (if it was around then). 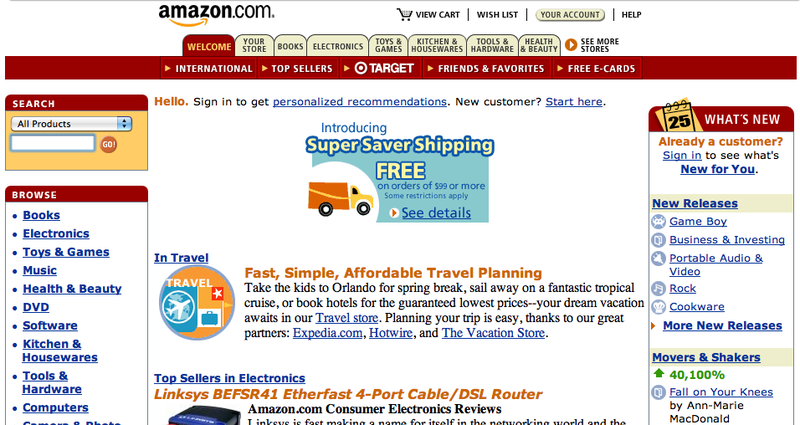 Amazon.com was around in 2002; let’s see what it looked like, shall we? A little different than it looks today. Considering how many various file formats and digital storage options we have already gone through in the past few decades, keeping one hard copy of every book isn’t a bad idea. Think about it: if you have some files on a floppy drive from 1998, can you still access them? And if you can’t access them, do they really exist, practically speaking? Whereas a book printed at the birth of the printing press hundreds of years ago can still be read by pretty much anyone (well, anyone patient enough to make their way through a whole variety of spellings). Toward the end of this TechCrunch article about how Random House just tripled the price of ebooks for libraries, there was a link to this well-written, insightful blog post on MetaFilter about why libraries are not anachronistic – about why, in fact, they are more essential than ever. On Friday a friend and former classmate and I went to the “Building the Digital Public Library of America” program at Harvard, where Robert Darnton and John Palfrey both spoke and answered questions. Darnton is the Director of the University Library and also a professor at Harvard, as well as a co-founder of the DPLA, and the author of The Case for Books, among many others; Palfrey is also a Harvard professor and the chair of the DPLA steering committee, as well as the author of Born Digital and other books. There are design challenges and technical challenges, but “these challenges can be met and will be met,” said Palfrey. As for what exactly the DPLA will contain or look like, he said, “What is the DPLA? We’re not sure yet. And we’re not sure on purpose.” People have dedicated themselves to workstreams for the five elements of the DPLA: code, metadata, content, tolls & services, and community. The biggest challenge is that of copyright; it’s why Google Books ultimately failed. In order to succeed, there must be some agreement between the creators (authors), the publishers, and the service/platform/distributors. Unlike Google Books, the DPLA aims to provide free access, not commercial access, to a broad public. Behind the DPLA is the belief that access to information is (a) the right of citizens, and (b) fundamental to democracy. The digital divide is one concern; despite the growth of e-readers and e-books, and the widespread (but not complete) availability of Internet access, for many people, print content is still more accessible than digital content, especially when digital content comes encumbered with DRM and other limitations. Another concern, raised during the Q&A on Friday, is how the DPLA will affect public libraries. The people working on the DPLA are pro-library; many are librarians. Darnton emphasized that they are designing the DPLA “not to undercut public libraries…[but rather] to reinforce public libraries.” The DPLA, he argued, would make public libraries more important: not only could they serve as an access point, but librarians could create and curate local collections. Overall, the DPLA “is a very complex ecosystem and we need guides through it.” Librarians, Darnton says, can be those guides. This is one of my answers when people ask if librarians are necessary anymore, because “everything is on the Internet.” Perhaps it is (though not everything is Google-able) – but can you find it? The proliferation of information, both in print and online, is overwhelming – “information overload,” anyone? – and most people could use some help sifting through the hundreds, thousands, or millions of search results to find something reliable and relevant. That’s one reason why librarians are necessary – and this librarian is excited to search within the DPLA as soon as it is up and running, just over a year from now.